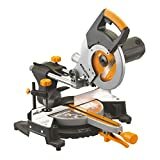 Any individual, who has an interest in woodwork and carpentry, will certainly want to own the best miter and chop saws. Some people call the work involved in the two fields artistic. This is because of the amount of precision that one needs and the level of creativity that is sometimes involved. Such reasons make having the best miter and chop saw essential. Miter and chop saws are also known as power miter saws, motorized miter saws or drop saws. It is basically a more enhanced version that is capable of cutting through even the hardest materials. Previously, people had to make miters manually. The biggest hurdle that people had was being able to cut an accurate miter out of wood. In order to do so, you had to invest enough time. This was a disadvantage if one had a project that they wanted to complete in a hurry. The best miter and chop saws enable craftsmen and carpenters to overcome such problems. Making miter joints at a far greater speed than you used to, is now possible. They also come in handy in framing construction. A chop and miter saw are essential in this technique. Framing construction requires a lot of frames to be made in a short period. This saw enables frames to be cut at a faster rate with complete accuracy. In molding, the best miter and chop saw makes work effortless. Using one ensures that you have as many pieces of moldings needed, without even breaking a sweat. Aside from that, you would also be able to take up jobs in different places. A miter and chop saw is portable, enabling you to take on even more projects without restrictions. The blade: The type of depth and cut you will get is determined by the blade of your chop and miter saw. The blades you choose will also enable to cut different styles and materials. You should be very keen because the type of finishing you get also depends on the blades. The finer the cut you want, the more teeth your blade should have as well. The Miter: A miter and chop saw cuts in miters or angled cuts. Make sure you check if the saw you plan to buy miters to the left or right. Afterwards, decide which one is more convenient for you to use. Dust management: When being used, saws generate a lot of dust. Check if the miter and chop saw you plan on buying can effectively manage the dust without the use of an extractor. Bevel and sliding action: Sliding will enable you to cut with greater width while making complex angled cuts is determined by the beveling action. Depending on the kind of work you plan to take on, the two actions can be very significant. You will need to take the two actions into consideration if they will affect your project. Black+Decker offers a compact solution with this M1850BD model. Whenever you need to work at other locations, this would be the most portable option to go with. The saw weighs less than 17lbs and is constructed using die-cast aluminum. 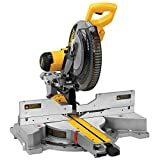 For people undertaking crown and base molding jobs, this is the ideal miter and chop saw. 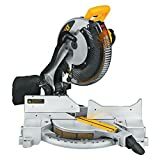 The saw can also be used for craft projects, framing and trim. It is as versatile as they come. The chop and miter saw’s miter range is 0-45° left and right. It has 9 positive stops. The Hitachi C12RSH2 has a compact slide system. Your chop and miter saw head will be able to slide alongside the fixed rails. Compared to other saws, the level of accuracy that you get will be outstanding. This is because it has a Laser Marker System, which enhances its accuracy. For flexibility purposes, the saw’s miter angle to the right is 0-57 degree and 0-45 to the left. With i, you will be able to flip the saw blade while leaving the material untouched. Doing so will be quick and easy for you. The reason behind that is that it has a bevel angle range of 0-45 degree to the right and left. The measurements of the miter and chop saw can be easily read. The settings can be accessed quickly. One of the most convenient options in the market is the Home craft H26-260L. You won’t encounter any difficulties, when dealing with any available miter saw stand. Miter and Chop Saw lightness in weight also makes it extremely portable. You won’t tire easily when faced with a workload. In terms of safety, it also takes a leading position. While loosening or removing the blade nut, the spindle lock holds the spindle in the most secure manner. It has also been designed with an ergonomic handle. Because of this operating the miter and chop saw is safer and predictable. The saw is able to cut nominal 4×4 and 2×6 at 90 degrees. It is able to cut 2×6 at bevel setting. The DEWALT DW716XPS has an Integrated XPS Cross Cut Positioning System. LED lights are also part of the system as well. 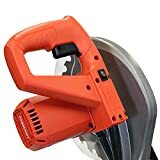 You will get extended power and durability with this saw. This is because it is able to deliver 3,600 RPM with its powerful 15amp motor. Making bevel adjustments will be easy and quick for you. Its high visibility bevel scale makes that possible. To ensure versatility at a greater level, the miter capacity is 0-50 degrees left and right. The miter and chop saw has a Cam-lock miter detent override. It has a large vertical capacity of 6-1/2″. 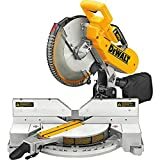 DEWALT used a new precise miter system for this saw. To make it more portable, it was designed with a handle. You will get a cut line indication which is adjustment free. This is because of the integrated XPS cross cut positioning system. You will also get an exclusive back fence design. The design is capable of cutting up to 2 by 16-dimensional lumber at 90-degrees. At 45 degrees, it will cut 2 by 12. Your purchase will come with a 90-day money back guarantee. The motor is very durable and powerful. Multi-purpose cutting will put you a step ahead of the rest. That is what Evolution Power Tools offers you. Patented multipurpose cutting technology, was incorporated in this miter and chop saw. You will have wood, mild steel, aluminum and plastics, all at your disposal to make compound miter cuts in. Your work will have an instantly workable finish. Compared to other alternative methods, it can cut through mild steel with no burs, heat or sparks. It is capable of making bevel and compound cuts. The miter and chop saw has a 28 tooth tungsten carbide tipped blade. When you purchase this item, you will also get a dust bag, blade wrench, a carbide blade, and comfortable side handles in the base. The saw has a stainless steel miter detent plate, which can be adjusted to your requirements. The miter detent plate also has 11 positive stops. You will get 4 hardened steel bevel stops at 0°, 33.9°, 45° and 48°. Thanks to this you will be able to get maximum versatility. It has the capability to cut crown molding while flat. The saw has a cam lock miter handle with miter detent override. For better material support, the Hitachi C10FCE2 has a large table. With this miter and chop saw, you can cut crown molding vertically. This is thanks to its large extended flip fence. It raises up to 4” in order to take achieve that. You will have complete comfort and control when using this saw. Reason being, its handle has a soft Elastomer grip which helps reduce vibration. The miter and chop saw has positive stops which have been thumb actuated. It has the capability to perform difficult cutting jobs. Maneuverability and portability are among the strengths of this saw. To add on to that, working with this miter and chop saw is really easy. Not only does it have excellent material support, it also enables you to secure the piece you are working on. This is thanks to its vice clamping system. Compared to the other saws it is more flexible and provides bevel cuts which are clean and accurate. Both the left and right miter ranges are 52. 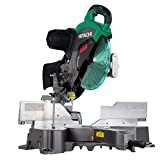 We have now come to the end of the 9 best miter and chop saws review. All the above-listed saws are definitely worth purchasing. 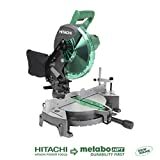 Our top recommendation, however, is the Hitachi C10FCG.The saw has many benefits but one thing stood out most of all. Your purchase will also include a dust collector attachment. For health reasons, it is important to always minimize airborne particles as much as possible.